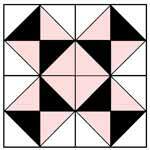 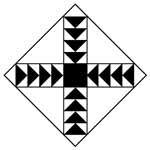 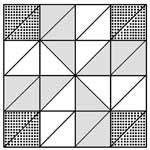 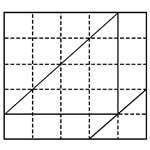 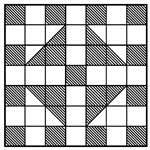 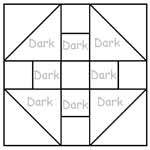 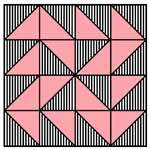 This traditional 54 – 40 quilt block pattern may be set diagonally or straight with plain blocks. 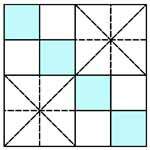 Strips might also be used if one prefers. 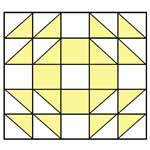 For a quilt measuring about 84 x 96, setting the blocks straight, and using two 3 inch strips for a border, 21 pieced blocks and as many plain ones are needed. 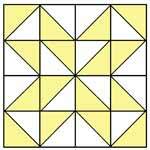 Treat as a 9-patch quilt. 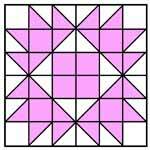 When made with pink, rose or yellow with green the effect becomes that of a bud, especially if the two color squares in the center are green, leading up to the green triangles. 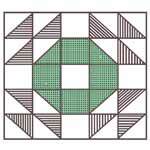 Fabric: You will need about 4 1/2 yards white, 1 1/2 yards green, 1 yard pink. 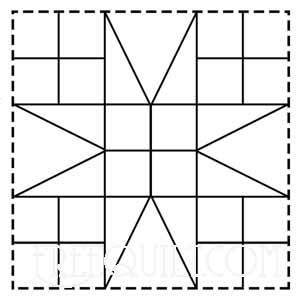 Click on the image to the left for the printable 5" block of the 54 - 40 Or Fight Quilt Block.